Slapshot is a wheeling, dealing game for hockey fans. Each player assumes the role of team manager. The object is to skillfully manage your team into the playoffs and then win the championship. During the regular season you can improve your team with drafts and trades, but injuries can upset the best of plans. Ultimately, your skill as manager determines if your team wins or loses. 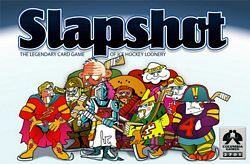 Slapshot includes 54 zany hockey players like Slash Gordon, Puck Rogers, Ian Jury, Cheap Shot, Le Goon, and Jack the Tripper. The new edition has high-quality playing cards with rounded corners. Slapshot is fast, furious, fun, and simple to play. Lace up your skates and checkout the game celebrated as the closing game each year at the World Boardgame Championships.